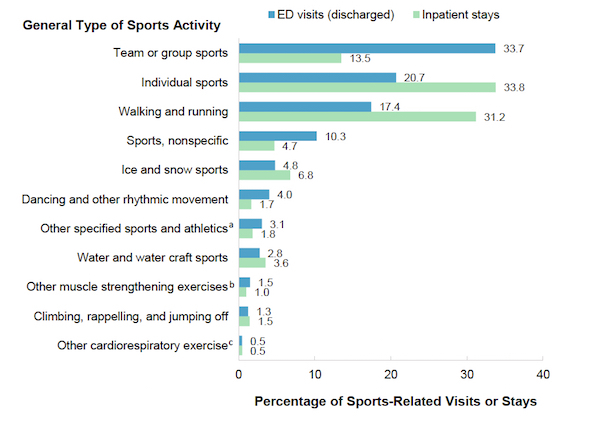 Notes: For fewer than 1% of ED visits and inpatient stays, more than one sports activity was identified. In these cases, the visit or stay is counted separately for each identified sports activity. The “other specified sports and athletics” category includes boxing, wrestling, and martial arts. The “other muscle strengthening exercises” category includes exercise machines, free weights, and Pilates. The “other cardiorespiratory exercise” category includes calisthenics, aerobics, and circuit training. Data Source: Agency for Healthcare Research and Quality (AHRQ), Center for Delivery, Organization, and Markets, Healthcare Cost and Utilization Project (HCUP), National Inpatient Sample (NIS) and Nationwide Emergency Department Sample (NEDS), 2013. This entry was posted in Medicine and Society Data Watch on July 27, 2016 by Christopher Barbey.